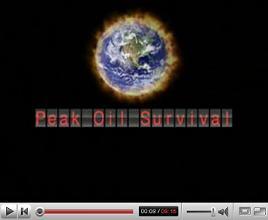 Peak Oil - "The Long Emergency" & "A Post-Oil Man"
"The Good News Is: Some People Will Prepare...": ..."A Post-Oil Man"
Some folks think this guy is an idiot but he is preparing for life after the oil crash. [panting] He a he a he. Yeah! A lot of people think I am an idiot. But we'll see who gets the last laugh. Hey. I bet they thought Noah was an idiot too. My ark will be out there poled on Texas with a mass of chickens and goats. Gee. If you think I'm a fool when you're opening that last can of beans and I'm sitting on ten acres of corn and suchini. When you are burning down your house in suburbia I'll be as snug as a bug in my dug-out with ochre growing down the roof. Yeah. You'll remember those laughs when you're trying to drink piss and my wind mill is pumping a bath tub full of water. You see I am getting ready now. Learning all about farming and canning, hunting and trapping, bicycling and recycling. 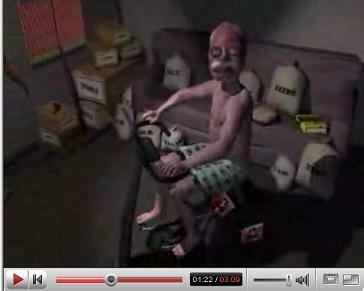 And there'll be the day when you're trying to eat your car seat and I'll be dining on Jack Rabbit and beer. So go right ahead and laugh. I don't really care because while you're laughing I am stocking up. On seed and tools and books, gun and ammo, bows and arrows, and lots of rope and wire and duct tape. That always comes in handy. I'm not quite ready yet for this new dark age. I've gotta get in better shape since ten years from now life won't be for the weak. I mean this ain't like that silly Y2K paranoia or something as simple as nuclear war. Even the bird flu would look like blessing spirit compared to this. And the proof is all around. You see the last hundred years of comfort prosperity on this planet. That was just a freak of nature. A lucky break that we burned up faster than a stick of dynamite stuck up the time-line of man. It's just a plain and simple fact. Too many people using too much oil. And believe it or not. It's all gone! Now if you think that's a bunch of baloney then you just haven't heard the facts. You're in for a rude awakening. Everything in your life depends on oil. And what happens without it? Well, you're already seeing the beginning. The oil wars, high prices. Then there'll come the riots and total anarchy, a fight for survival. No Caribbean cruises or flying off to Paris for shopping. Hell. You couldn't even drive to the mall if there were something to buy there. I mean we're talking the end of life as we know it. Without oil we'll be stepping back two hundred years. Except worse. Because most of you all won't be prepared for it. But me on the other hand, I'll be ready. And this fool even has new career in life. And I'll be the richest man in the county because when this new dark age comes he-a-he-a-he getting drunk will be about the only pleasure left. We know that no amount of creativity can revive extinct species and recreate lost resources, burned, consumed and gone forever. Many people believe that ingenuity i.e. technology can feed more people with more goods whilst simultaneously the raw material stocks are declining. Human intelligence should lead to a revision of long-cherished paradigms of endless progress. We will face the hard material realities of the end of luxury. This is not a matter of political thought or finding energy sources. It is matter, that is earth, food, water, the necessities of subsistance. 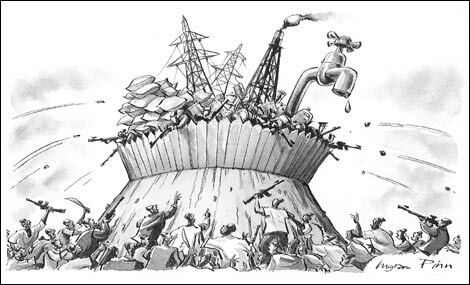 Either we reduce our consumption or we will perish. compare: The global battle for food, oil and water"